The Straits Settlements consisted of Malacca, Penang and Singapore (the first two nowadays situated in Malaysia). 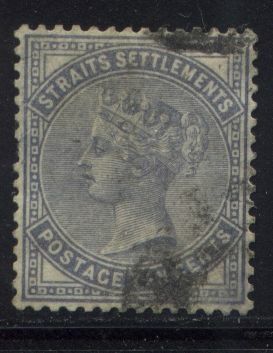 BANGKOK: Stamps of Straits Settlements overprinted with a 'B' were used in Bangkok. Stamps of Sraits Settlements overprinted with 'P.G.S.' were used in Perak. 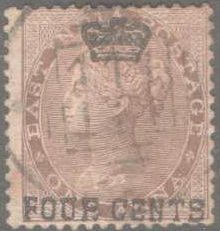 Before the introduction of its own stamps, the stamps of India were used in Straits Settlements. Some cancels that can be encountered are 'B172' (Singapore), 'B109' (Mallaca) and B147 (Penang). For the specialist: these stamps should have a watermark: 'Elephant-head'. 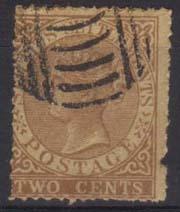 In the left stamp, the 32 cents overprint is added after the cancel. 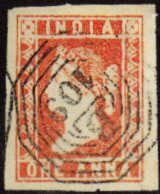 The second stamp is also a forgery with the 32 cents overprint added to India's stamp with the wrong shade. 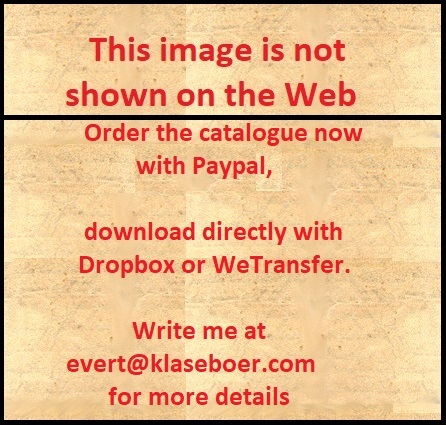 For surcharged stamps click here. For cancels click here. All these stamps have perforation 14 (unless otherwise stated). In the 4 c, 6 c, 8 c, 12 c and 24 c the corner ornaments are all the same as in the 2 c! 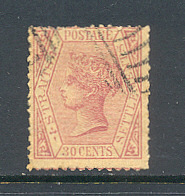 However, in the genuine stamps, the corner ornaments differ for all values! 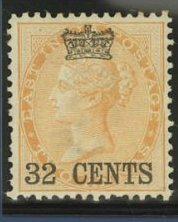 The 32 c stamp looks the same as the genuine stamp, however, the bottom of the 'A' touches the 'G' in the word 'POSTAGE' in this forgery (in the genuine stamp these letters don't touch). I have seen the 2 c red and the 4 c brown with this overprint. These stamps have watermark 'CA Crown' and perforation 14.